What height are stratocumulus virga clouds found? Stratocumulus clouds are formed at low levels, which means they can be seen up to around 6,000 feet in the sky. Although the stratocumulus clouds have water droplets in them, when they have virga attached to them, the rain contained in the virga trails will evaporate before it gets a chance to drop to earth. It has to be said that virga can accompany cloud formations much higher than 6,000 feet, depending on the air conditions. Stratocumulus virga clouds are not a cloud formation as such in their own right; rather they are an appendage or accessory to other cloud types. This means they are attached or adjacent to other types of clouds. Dropping from the bottom of a cloud base can give the most dramatic of scenes. The trails or rods that can be seen contain water drops but these evaporate quickly on contact with warmer airflow. How are stratocumulus virga clouds formed? 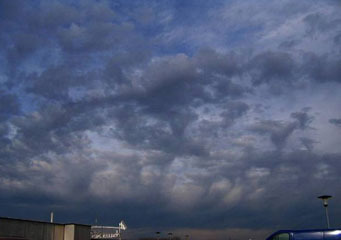 Stratocumulus virga clouds are formed in the usual way, i.e. convection. However, the virga are formed when the rain starts to fall from the stratocumulus clouds and there is a change in air temperature, causing the water droplets to condense, forming the trails or branches that are clearly visible. These water trails will eventually evaporate once atmospheric conditions allow them to release their load. What do stratocumulus virga clouds look like? Stratocumulus virga clouds can be seen best at sunset or sunrise. They look like trails of clouds hanging from whatever cloud formation they are attached to. They hang down and can really add to sensational sunsets as the sun lights them from underneath. Often stratocumulus virga clouds can be mistakenly labeled cirrus clouds, as they can look the same to an untrained eye. These types of clouds are not generally dense, which is why the sun backlights them with such intensity. How common are stratocumulus virga clouds? Stratocumulus virga clouds are more common in the desert and other regions of warmth and high humidity. These types of clouds can add to a thunderstorm. This is because as the cells are released into air that is already at saturation point, so they can be the nucleus of a thunderstorm bearing cloud. Where can I see stratocumulus virga clouds? Stratocumulus virga clouds are more common in the desert and regions of warmth and high humidity. You can also find these types of phenomenon in North America and Canada.